Marijuana stocks have been all the rage as legalization for medical and personal use has expanded. Leading the way is superstar Canopy Growth (NYSE:CGC). CGC has been riding high as it continues to see rising sales and has racked up some major deals with blue-chip companies such as Constellation Brands (NYSE:STZ). There’s a reason why Canopy could be one of the marijuana stocks first real winners on the race to profitability. Part of the reason is that Canopy is forward thinking. Just as it made some of the first moves into cannabis-infused drinks and other products with its STZ partnership, it’s doing so with its latest deals. That will have it front and center in the animal and pet health marketplace. Don’t laugh. Petcare is a booming and thriving business. Fertile ground for marijuana stocks to profit. And now, Canopy Growth has the chance to be the leading cannabis stock in the sector. The American Pet Product Association data shows that annual expenditures by consumers for their pets have grown in each of the last 18 years. This includes during the Great Recession. Last year alone, Americans spent a whopping $72.56 billion on their pets. This includes $18.3 billion on veterinary care and $15.5 billion on supplies and over-the-counter medicines. This year, the APPA estimates that number will surge to more than $75 billion. The truth is, American’s are very willing to spend on their fur babies. What does this have to do with marijuana stocks? While cats and dogs are very different than people, they do benefit from some of the same treatments for ailments. A lot of feline and canine drugs have been derived from their human counterparts. For example, our vet prescribes half a Benadryl tablet for our dog when his spring allergies start. CGC is poised to win in the booming pet care market thanks to another smart partnership. Around the end of March, Canopy cut a deal with Sequential Brands Group. The deal with Sequential puts CGC right into the thick of the pet care market as the collaboration focuses on the pair developing new hemp-derived cannabidiol (CBD) products for animals. The deal was sort of swept under the rug as other marijuana stock news was breaking around that time. But in the deal, was a huge coup for Canopy. And that was Martha Stewart. The homemaker and entertaining queen provides plenty of brand cache for Canopy as she will become a strategic advisor on the firm’s pet and hemp-product lines. Stewart has long been a pet advocative and her chow chows have become stars in their own right. With her on board, sales for whatever CGC develops could quickly find a foothold and command some high market share in the CBD pet product sector. One of the chief reasons why Canopy has been crushing other marijuana stocks has been the strength of its celebrity and major corporate partnerships. The firm has been able to get out in front of some major trends — like CBD-infused drinks — and has been able to capitalize on that with big deals. Pets and animal health will be no different. By adding Martha to the mix, it legitimizes its future products and gives it a major edge on supermarket shelves. That’s something other pet-focused marijuana stocks like Medical Marijuana, Inc. (NASDAQ:MJNA) or CannTrust Holdings (NYSE:CTST) may not be able to match. All in all, it’s just another reason why CGC is pulling away from the pack. The reality is, the pot sector is quickly turning into a one or two horse race with Canopy leading the way. The firm continues to make major transformative deals to get itself out in front of major trends. It’s under the rug deal with Sequential Brans puts it right front and center in a huge and growing market. The branding with Martha Stewart will only enhance that further. For investors, it’s just another example of why CGC is the cannabis stock to own. 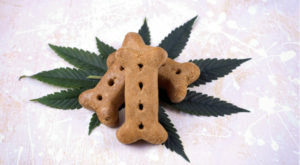 Article printed from InvestorPlace Media, https://investorplace.com/2019/04/pot-for-pets-canopy-growth-is-on-the-bleeding-edge-of-marijuana-stocks/.